A couple of weeks ago, we were sent a BuggyTug to review and if you have been to hilly Bristol before, you will have already guessed that this clever invention was very much appreciated in our household. 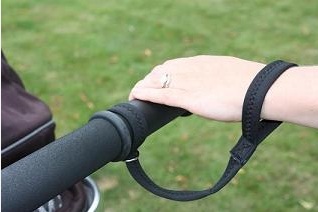 The BuggyTug is the UK’s first pram wrist strap and is designed to ensure that should you take your hands off the pram that it won’t go rolling down the hill. What does Mummy Alarm think about the BuggyTug? The wrist strap is made out of black neoprene and super comfy. The BuggyTug doesn’t cut into your skin and your hands don’t get sweaty when you have it wrapped around your wrist. In fact, it is so light that, even while going for a longer walk, you don’t notice that you are actually wearing the BuggyTug. The main benefit of the BuggyTug however is its simplicity. It might look a little plain but it does exactly what it promises on the box. There are no funky patterns on it, it is short (making sure it doesn’t get tangled) and you can easily wrap it around your wrist without having to read a novel-like manual. Most of all it keeps your little one save without breaking your bank. The BuggyTug costs £3.99 and is available on the official BuggyTug website where you can also find a list of other stockists. For me it is an absolute must-have for new mums because it just gives you the little extra bit piece of mind that you need when you take your baby out for their first big walk.